Pooja's Travel Notes: My first trip to a third country! My first trip to a third country! Besides the country in which I was born and the one where I live, I had never stepped out beyond the airport lounges of any third country until last month when I set my feet on the Canadian soil in its Victoria city in British Columbia. The journey was very short, a 3 hour ferry ride operated by Victoria Clipper and so was the trip - less than 48 hours long! 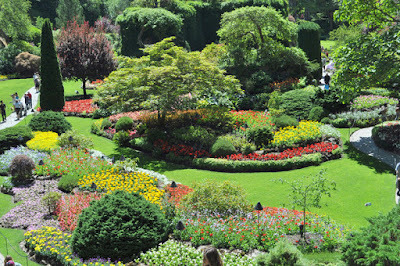 We reached Victoria before noon on a beautiful sunny Saturday and set off on a bus ride to the famous Butchart gardens. The guide on our bus gave some interesting facts about the city, which unfortunately didn't interest us a whole lot! And so I know why I don't remember any of those! The gardens are huge and beautiful, it is in fact a collection of several smaller gardens like rose garden, Japanese garden, Italian garden, sunken garden and many others. Before we toured these gardens and got engrossed in photography and posing, we got some coffee and ice-cream, though we had lunch just about an hour earlier before we hopped onto the bus! We laughed at the obvious thought, expressed our dislike for the non Starbucks coffee and laughed again and ate all the ice-cream and then toured the gardens. The city is a small pretty tourist destination! 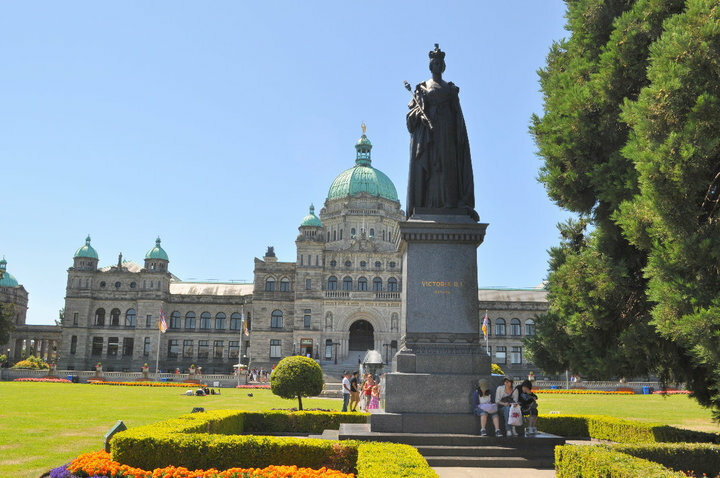 The Fairmont Empress hotel and parliamentary buildings are the pride of the downtown. An afternoon hight tea at the Fairmont Empress is one of Victoria’s grandest traditions, but we are not tea-lovers and so we are among the less than a percent of people(my guess!) who did not experience this tradition in their Victoria trip! We walked through the small downtown, capturing the city in its touristy busy, and picturesque look! We also walked though its Chinatown that has flamboyant gold tiles and red pillars at its entrance and we enjoyed a delicious Asian meal. The Fan Tan Alley in Chinatown is the narrowest lane in Canada (only 0.9 metres wide), which is a much hyped place to see than what really looks like a narrow crack between 2 red-brick buildings! The trip was a milestone in my life since I visited a new country! And we left Victoria with some great memories of a scenic, beautiful and relaxing weekend.